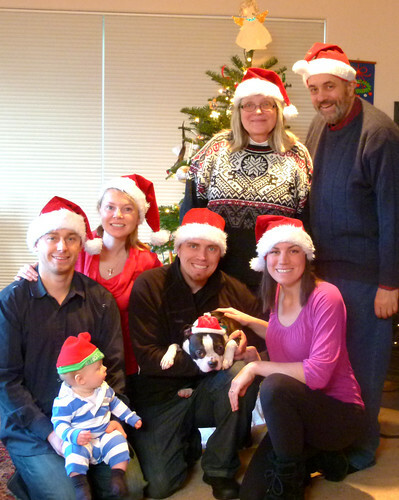 Jamisen’s first Christmas was a memorable occasion for us all. We started our holiday weekend with Christmas Eve service (which was really a morning service coupled with a delicious brunch). Jamisen was happy and had such an easy going attitude the entire time. He was passed around from person to person and he was sure to favor them all with smiles. There were two childrens’ stories and he sat patiently through both of them. It was a very special Christmas for Jamisen. Santa chose our house to make a personal appearance! 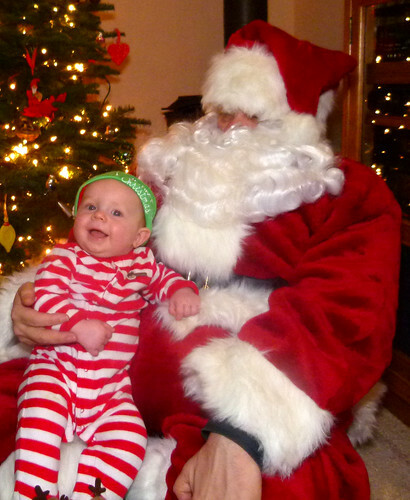 Just check out the look on his face as he sees the jolly man in the red suit – it’s a mixture of terror, wonder and curiosity. That blur at Santa’s feet? That’s nephew dog Toby, protecting his family against the intruder. We were thankful for his 38 pounds of ferociously adorable protection. He warmed up plenty quickly to our honored visitor. He especially appreciated the gifts that the red-suited man doled out. He became quite adept at unwrapping and loved to play with the paper of each gift. Between his two sets of Grandparents, Jamisen is going to be the best dressed little boy in all of Bellingham. Chris and I are thankful for the love and support of our family, both during the holidays and as we continue our new role as parents. What a precious, handsome baby! It reminds me of that joyous time with my 2 boys (9 and 11). Thank you for sharing your pictures; and congratulations, Anne-Marie! Merry Christmas and Happy New Year. Aww! Thank you for sharing! Hope he had an amazing Christmas AND that he recovered from grinch shock! A little Santa definitely cancels out the Grinch shock, I’m sure. Awesome photos Anne-Marie. Thankyou for sharing. Your family looks so full of love. So special. If only everyone in the world had families full of love, caring and sharing. Happy Christmas to you too! Jamisen, you are adorable! 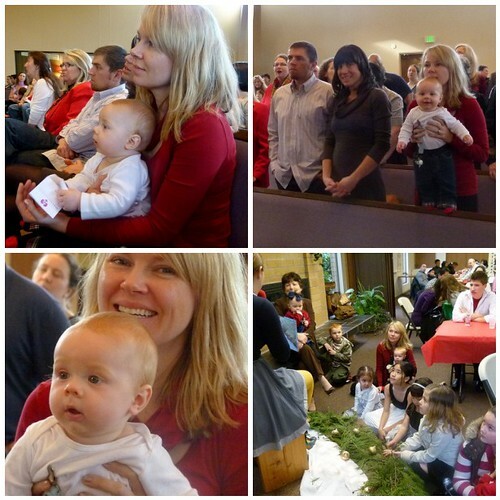 Great pictures…I love the way Jamisen is checking out Toby with his hat, in the first picture. 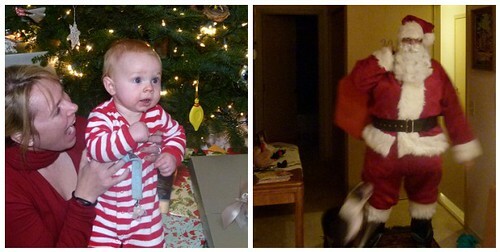 I loved my babies first Christmas. Such adorable pictures and Jamisen is such a cutie. Yes, the first Christmas is very special or rather, WAS very special. =) Our little guy definitely enjoyed it.